Product #16857 | SKU ROI | 0.0 (no ratings yet) Thanks for your rating! AJA's ROI DVI to SDI Mini-Convertor converts a DVI signal to an SDI output, enabling you to use computer signals in digital video workflows. On an included MiniConfig software application compatible with Macs and PCs, you'll be able to select a Region of Interest from the input signal and assign how the region is scaled to the output. You can assign image scaling and extensive aspect ratio and frame rate conversions. The Convertor syncs up to the MiniConfig application via a USB cable connection to the host computer. A USB cable and a universal power supply are also included. 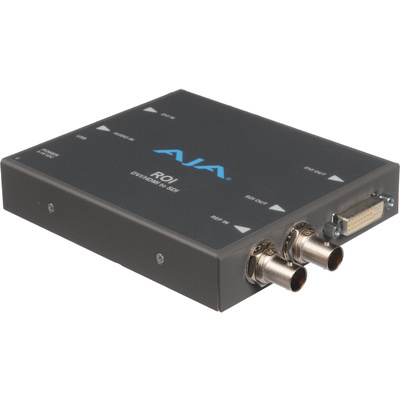 A 3.5mm TRS input supports 2 channels of analogue audio, the SDI output supports 8 embedded channels at 24-bit, and the DVI input supports 8-channel, 24-bit HDMI embedded audio if you use a DVI-to-HDMI adapter. In an included MiniConfig software application, you'll be able to select a Region of Interest in an incoming DVI or HDMI signal and control how that region is scaled to the output resolution. This selection will let you eliminate extra interface clutter and menu bars and extract only the portion of the image you want. The Convertor features a DVI loop through enabling a connection to an external DVI monitor (or HDMI monitor via a DVI-to-HDMI adapter) while converting to SDI. A Reference input ensures the SDI output is genlocked for use throughout a production or facility. The Convertor accepts 2-channel audio from a 3.5mm analogue audio input or embedded 8-channel audio from an HDMI input (DVI-to-HDMI adapter). The audio source and routing can be selected in the included MiniConfig software and is embedded in the SDI output, allowing computer audio to be embedded within the SDI signal for easy, synchronised routing.